Welcome to my site. This is where I will document my many cycling holidays in China, mostly self supporting with my trusty Surly LHT. I will provide ideas, route information, exciting experiences and my love/passion for the wonderful country that is China. we drove past so many farmers, peasants and as the guide said, workers who were happy to work hard with primitive hand tools on the road side. Lunch was in a restaurant in the VIP room, we were not allowed to mix with the locals and finally a tour of Sun Yat-sen’s birthplace, in the village of Cuiheng, Xiangshan County (now Zhongshan City), Guangdong. We have a strong memory of the sparse souvenir shop with surly serving staff at Sun Yat-sen’s house, it was very poorly stocked except for two things, we could buy coca cola and beautiful fish paintings by Woo Woon Leung. We both loved our trip to Hong Kong, Macau and China. We found so much beautiful art, china, furniture, architecture, markets, culture, history, the list went on and on, but we had to wait 25 years to return due to having children, buying a house, life. On our 25th wedding anniversary, 2009, we retraced our steps but this time it was soooo different. We caught a train from Hong Kong and travelled independently to Guangzhou, we caught taxis, subway trains and stayed at the White Swan hotel on Shamian island, Guangzhou. This trip was dramatically different to 1984, the progress and vibrancy of China was incredible. We had a few language problems but we fell in love with China again. 2009 was a turning point in our life, we moved out of our family home in the outer suburbs of Melbourne, we had a city change, downsized and moved much closer to the city. Our lovely new neighbour owned a Mandarin language school, running classes after work near my work place. It seemed I had an obvious/pre ordained decision to start learning Mandarin and have been learning formally and informally off and on since. Apart from my family and China my other great passion is cycling. One of the selling points of our city change is that I can cycle to work everyday. Once I started Mandarin lessons I thought a great learning tool would be to wander or cycle into the chinese countryside away from all english speakers and immerse myself by navigating, finding places to eat, ancient towns to visit and accommodation. Based on the traffic I had seen in Guangzhou, my lack of knowledge on how to start this sort of adventure and fears, this idea remained a far off dream for a number of years. I kept up my studies for a number of years and in 2012 I read an article about a private language school in Beijing Live the language. This school was given rave reviews and offered short courses with homestay accommodation as an option. I took the plunge and booked a weeks one on one intensive Mandarin language training, a homestay with a Beijing family and a second week for sightseeing with my wife in April 2013. Little did I know the impact on my life this trip would make. On the first morning of on my langugage course, my host showed me the bus and walking route to the door of the language school. The school is located in the CBD of Beijing about 5km away from my homestay in a fairly direct line. The buses were packed and not the most pleasent way to travel. I discoverd during my first day of lessons, the school provided free use of a bicycle. The bicycle was way too small, very old and basically the brakes were non functioning. I jumped at the chance to use the bicycle much to the schools horror I think. Beijing is a dead flat city so the lack of brakes was not a problem and I managed to navigate my way back to the homestay and avoid the crazy Beijing traffic. There are wide bicycle paths but they are full of people walking, scotters and bicycles going the wrong way. Language course supplied bicycle, way to small and no brakes. It was wonderful and changed my life. When my surprised host spotted the bicycle, and they realised I was willing and able to cycle around the city, they suggested I get up at 6am to ride with my host to a nearby park where he gave taichi lessons every morning. My couse started at 9am, so I readily agreed. We headed out on a clear crisp morning and starting riding what I thought would be a short ride. 30 minutes later after riding past the landmark underpants building I had a different view. During my home stay week, I rode to three different major parks all over central Beijing, including the Temple of Heaven, and a beautiful park in the embassy district. I then had to navigate to my course from where ever my host had taken me that morning. The traffic was crazy crazy busy but had a non agressive flow to it, and I found it absolutely thrilling. I found I needed a bit of bike maintenance one morning, I easily found a street side bicycle repairer who tighten up the problem after a quick twisting hand gesture and pointing. I went on to do much more Beijing cycling after I discovered the first Beijing vintage (like a British tweed) ride was being held on my free day, Saturday, waiting for my wife to arrive. This ride was marvelous, a hundred or more locals and expats dressed to the nines in old fashion clothes and on all sorts of beautiful old bikes. We rode from the olympic stadiam to the arts district, 798, where we had a party and fashion show. This trip changed my life as I immediately realised I was capable of cycling, getting repairs, navigating and immensely enjoy cycling in China. 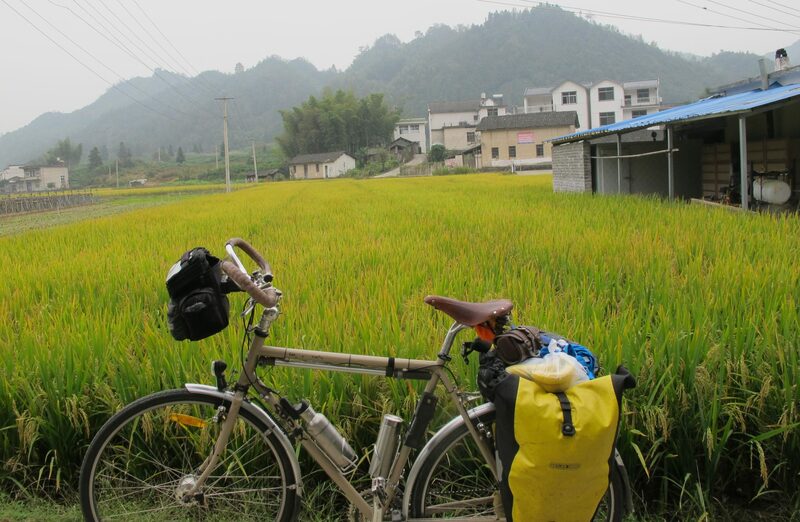 My language was good enough, no need to delay or wait, so I booked up my first unsupported bicycle ride in China, two weeks starting from Hangzhou, for the following year, 2014, starting in October after the Chinese national holiday rush. Feel free to contact me with any questions about cycling in China.